By 2020, 60% of organizations will have articulated a digital transformation strategy and will be in the process of implementing it. What attributes define data-driven organizations? What tools and processes do these organizations use to achieve their superior results? 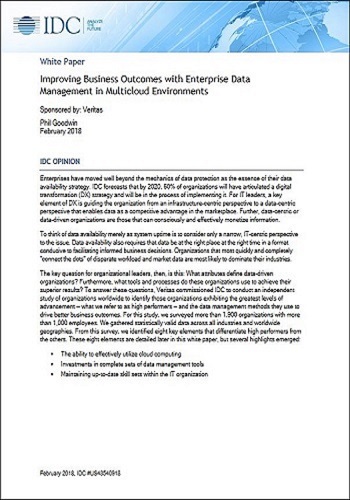 To answer these questions, Veritas recently commissioned IDC to conduct an independent study of organizations worldwide to examine the data management methods they use to drive better business outcomes. The study reveals that only 19.7% of organizations believe they have the IT skills they need. Additionally, 80% of organizations are failing to meet cloud data recovery service-level agreements (SLAs). The survey also yielded a number of interesting data points, some of which are alarming. These fall into four categories: permanent data loss, data availability outages, looming cost of compliance failure and cloud data management deficiencies.